Bring technology, style and efficiency to every adventure with the Toyota RAV4. The RAV4 is one of the most unique crossover SUV’s of its class with its considerable number of standard features that altogether create a superb vehicle. You’ll surely notice this once you take a step inside its spacious cabin and discover the extensive collection of intuitive tech that’s all within reach. The RAV4’s innovative tech is not only within reach of your fingertips, but your foot as well. The RAV4’s driving performance is responsive, intelligent and fully capable of handling your daily commutes, as well as your extravagant adventures. It’s available On-Demand All-Wheel drive system helps you get even more from your endeavors with complete traction. Whatever your destination may be, you’ll always arrive there in style too. The RAV4’s stunning appearance is refined and sporty—naturally, it leaves a lasting impression on those you pass along your way. Fully redesigned for the latest model year, the 2019 Toyota RAV4 shows off its changes from the outside in. New exterior styling elements like reconfigured LED head and taillights, a rear spoiler, and dual exhaust give the RAV4 a bold and sporty appeal that will earn it plenty of second glances – even among all the other compact crossovers on the roads. Inside the redesigned RAV4, Toyota Safety Sense 2.0 joins enhanced technology, driver assistance, and convenience features and comfort amenities that will make every drive relaxing and enjoyable for all. When it comes to road performance (on highways and backroads alike), cargo and passenger space, and overall value, the 2019 RAV4 upholds the vehicle’s reputation for offering everything you expect and then some. Turn to Thomasville Toyota for more information about the 2019 RAV4, its capabilities, its features, and its admirably equipped trim levels. We can get you an amazing deal on this latest version of Toyota’s beloved compact crossover. With its initial debut in 1994, the RAV4 became the first ever compact crossover SUV to have been built and has since then redefined the SUV class. Having undergone over four generation’s worth of modifications, the RAV4 has always focused on keeping its fundamental priorities in its design. These priorities include its high safety standards, performance capabilities, engaging appearance, an ample interior, and intuitive technology. With consistent improvements over the years and experimenting with its exterior design, in 2012 Toyota debuted a newly revamped RAV4 that would pave the way for its future. 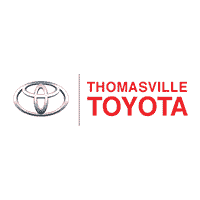 At Thomasville Toyota, we love the Toyota brand and we love helping people find their ideal ride. If you are even thinking about trying a Toyota, then you should consider us your welcoming committee. Our team knows Toyota better than the back of their hands. They can provide you with all the information that you may need. Feel free to provide them with a challenge, and we will show you the breadth of our skills and talents. We don’t pressure you or try to force you into anything. Instead we give you quality service and genuine feedback. Let our Thomasville, GA Toyota dealership provide you with the options that you need, whether it be a new or used Toyota vehicles. Our Toyota dealership is near Valdosta, GA and Tallahassee, FL; come see us today!